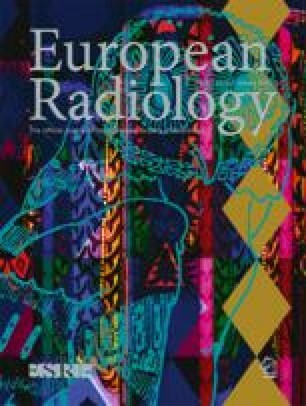 The aim of this study was to review and reappraise the clinical and CT features of malignant peritoneal mesothelioma (MPM), and to discuss differential diagnosis. The history, clinical, and laboratory data, and imaging studies of 11 patients with a histologically proven diagnosis of MPM, were retrospectively reviewed. Our patients consisted of 7 women and 4 men, with a median age of 48 years (age range 40–55 years). There was a definite history of significant asbestos exposure in 6 patients. Abdominal swelling (9 of 11) was the most common presenting symptom. The mean serum CA-125 (normal value 1.2–32 U/ml) level was 230 U/ml (range 19–1000 U/ml). The most common radiological findings were extensive or moderate amounts ascites (11 of 11), irregular or nodular peritoneal thickening (11 of 11), omental involvement (10 of 11), mesentery involvement (9 of 11), pleural thickening, plaques or calcification (7 of 11), pleural effusion (6 of 11), and bowel wall thickening (5 of 11). Two patients had large upper abdominal masses. Computed tomography findings of MPM are nonspecific and inadequate to pinpoint specific diagnosis. The diagnosis requires histological demonstration which is commonly made by an image or laparoscopic-guided biopsy. Pleural changes suggesting asbestosis combined with CT findings and high CA-125 levels can suggest, but are not diagnostic of, mesothelioma. Suggesting the diagnosis of MPM is important because histological and immunohistochemical tests are needed for diagnostic accuracy.